Join LAPA as a Fellow or Associate Member and Attend all Three Days of the Conference. Discounted membership, 22 hours of CME, includes workshops, networking, time spent with vendors showing the latest products on the market for our patients. Admittance to the conference one day only. Must specify which day attending in registration process. 8 hours of CME, networking time, updates on PA Advocacy in Louisiana and time to talk to our sponsors about the most recent products out on the market for our patients. Admittance to the conference all 3 days. Must be a current member of LAPA. Rate increases after July 15, 2019 to $450. Includes workshops. 22 hours of CME, networking time, updates on PA Advocacy in Louisiana and time to talk to our sponsors about the most recent products out on the market for our patients. Admitance to the conference all three days after the date of July 16, 2019. Includes workshops and you must be a member to receive this reduced rate. 22 hours of CME, networking time, updates on PA Advocacy in Louisiana and time to talk to our sponsors about the most recent products out on the market for our patients. Member of LAPA admitance on Thursday only. 6 hours of CME, networking time, updates on PA Advocacy in Louisiana and time to talk to our sponsors about the most recent products out on the market for our patients. Admitance to the conference all three days of the conference with registration after July 16, 2019. Workshops are included in fee. 22 hours of CME, networking time, updates on PA Advocacy in Louisiana and time to talk to our sponsors about the most recent products out on the market for our patients. Non member admitance all three days of the conference. Price includes workshops and will increase after July 15, 2019. 22 hours of CME, networking time, updates on PA Advocacy in Louisiana and time to talk to our sponsors about the most recent products out on the market for our patients. Admitance to the conference for one day on Tuesday or Wednesday. Must indicate which day in registration processs. 8 hours of CME, networking time, updates on PA Advocacy in Louisiana and time to talk to our sponsors about the most recent products out on the market for our patients. Admitance to the conference Thursday only. 6 hours of CME, networking time, updates on PA Advocacy in Louisiana and time to talk to our sponsors about the most recent products out on the market for our patients. Admittance to the conference all three days. Must be a member of LAPA. 22 hours of education, networking time, updates on PA Advocacy in Louisiana and time to talk to our sponsors about the most recent products out on the market for our patients. Must be currently enrolled in a PA program and a member of LAPA. Admitance to the conference all three days. 22 hours of education, networking time, updates on PA Advocacy in Louisiana and time to talk to our sponsors about the most recent products out on the market for our patients. 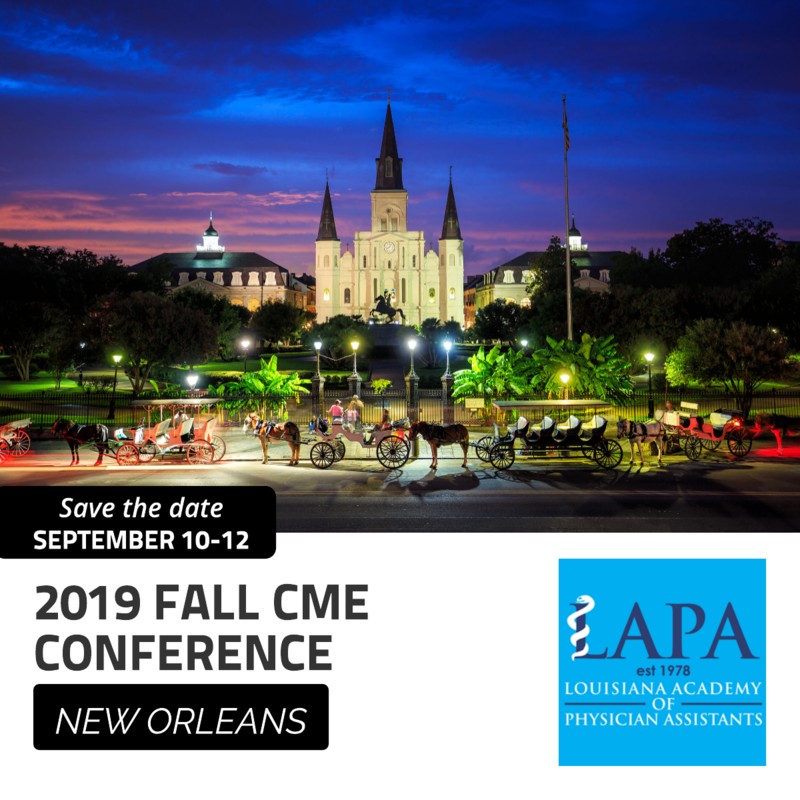 28 hours of CME has been applied for with AAPA . Only 22 will be available per person to earn at the entire conference.